Prensky (2001) challenges that, “Our students have changed radically. Today’s students are no longer the people our educational system was designed to teach.” Teaching in the 21st century lends itself to transformative strategies and technology enabled teaching and learning. As I have said earlier, I constantly evaluate my practice and strive to improve what I do and look for new ways to make learning effective. Digital natives or millennials (albeit few and far between) are sitting in our classrooms, and they seem bored and unmotivated to learn with traditional teaching methods. Digital ‘illiterates’ (as I would call them), are also sitting in our classrooms. Although born in the digital age, they lack IT skills and many of them have never seen or touched a computer before. They have a sense of awkwardness with the technology. Additional challenges of access widen the barriers.Yet they too, have to live in a world fully integrated with digital devices and technology. 2nd language barriers compound effective student learning. University preparedness - many of our students are unprepared for higher education. They lack many of the critical crossfield outcomes that they should have acquired in school. 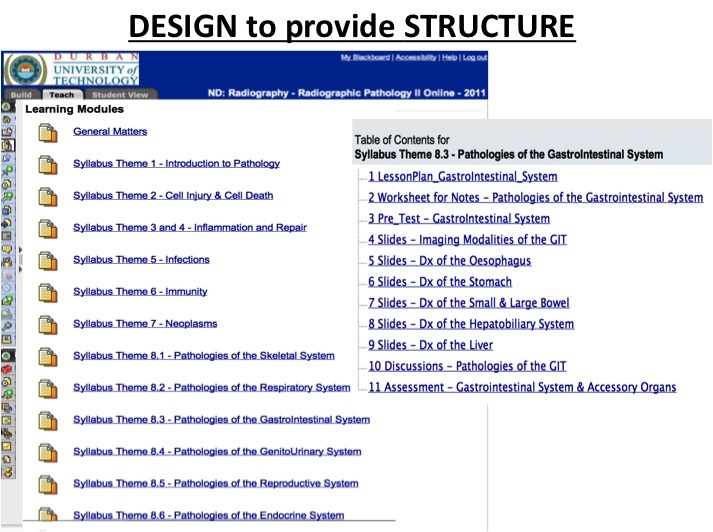 Radiographic Pathology II - subject specific challenges that were also evident. Volume - in the current curriculum, this subject is taught over 1 year. This includes general pathology and systemic pathology. 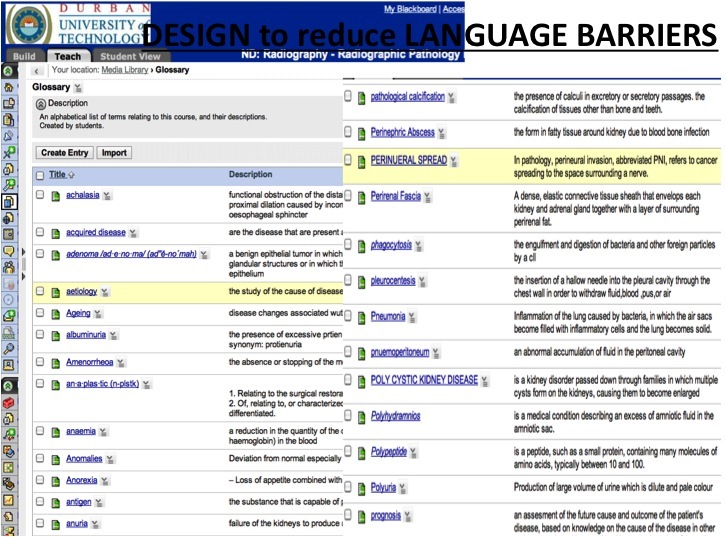 Language - new medical terminology, and even greater challenge for my 2nd language students. Didactic content and instruction– mostly considered dull and boring. Practical component – very challenging. 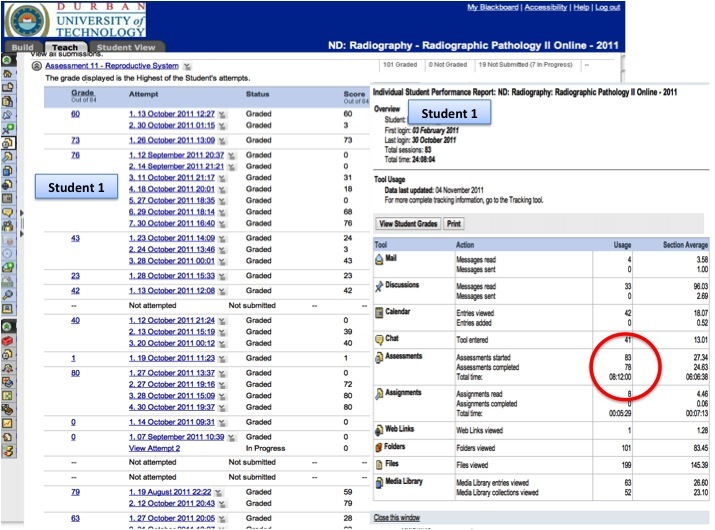 Students must demonstrate ability to identify common pathologies on radiographic images. 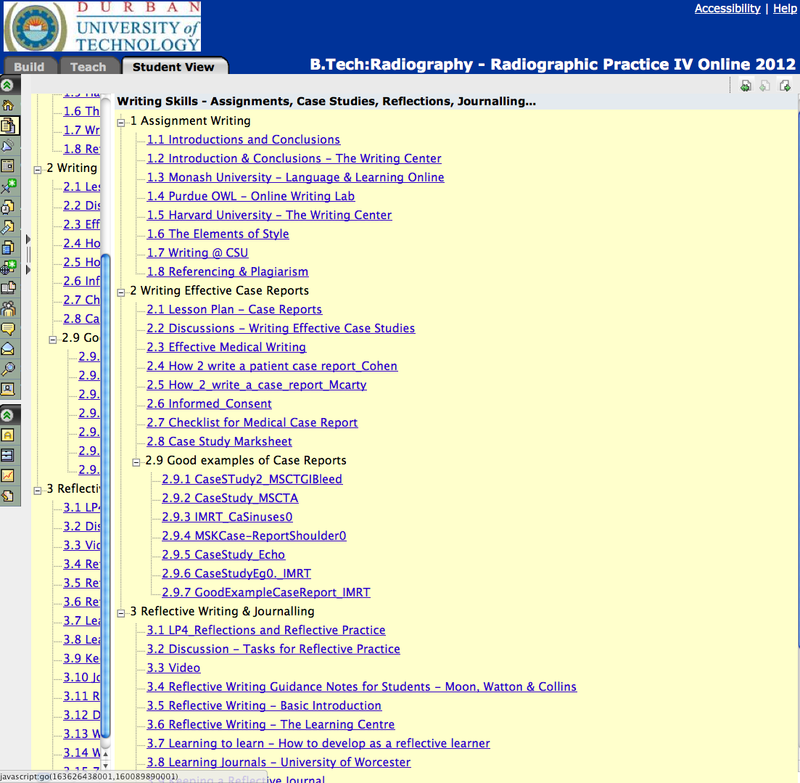 Radiographic Practice IV - subject specific challenges that were also evident. No textbooks – in a rapidly advancing discipline, content changes all the time. Furthermore, students work in different clinical contexts, so their academic needs vary. Greater reliance on the internet for current up to date information. Part time offering - although it is a heavily credited subject, there is limited contact time, one weekend a month. Student diversity – digital natives and digital immigrants. Varying degrees of clinical experience. Varying ages of adult learners. In the light of these challenges, I found myself asking how I could transform my teaching to meet the gaps and enhance motivation to learn. Furthermore I was concerned about enabling my students to engage with the 21st century culture of teaching and learning and becoming global citizens. My desire was to empower them to become producers of knowledge and not just consumers. My teaching philosophy to foster independent learning will not be compromised. When students are challenged in this area for any of the reasons stated above, it becomes necessary and important to provided scaffolding and support, while they grow. Multi faceted changes in my classrooms emerged, as the need arose. Digital Imaging – Earlier in my teaching, film-viewing practical sessions were a challenge for both the students and myself. Some challenges: availability of lightboxes to view xrays, smaller student groups meant repeating the lesson, students demanded individual attention. 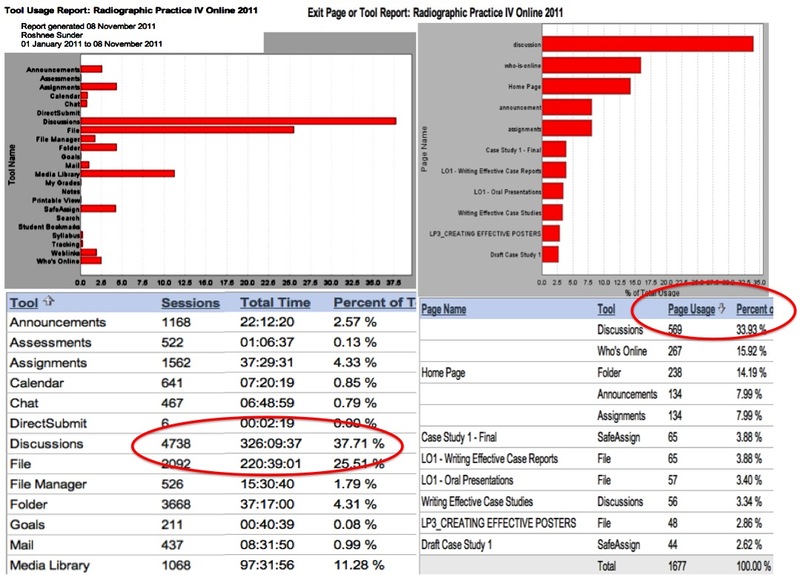 Solution: digitized film library and customized image slideshows. A single projector and white screen replaced 12 – 15 lightboxes, lesson was completed in one sitting, and students received individual attention. The example is transformed assessment in a level 3 subject - Digital Image Assessment . This lead to optimisation of resources. 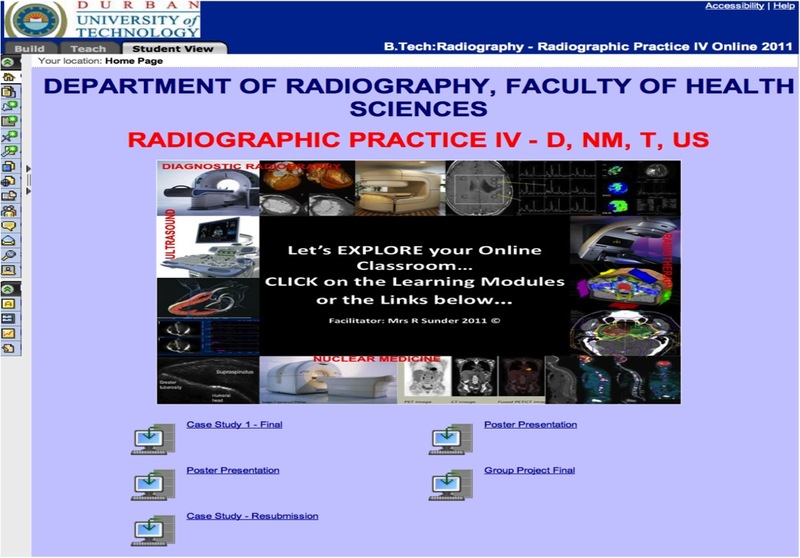 Lecturer generated videos - (see Lecturer Podcasts – Samples: Chest Pattern Recognition series, Trauma, CT imaging and audiocasts) – We are dealing with very visual learners and teaching in the era of Youtube, forced me to relook at my teaching materials. Analog imaging shifted to digital imaging, which transformed further from image slideshows to enhanced podcasts. While one will find a video on any topic on the Internet, not all are suitable or relevant or academic. So in 2009, I started creating some videos using Windows Movie Maker. Initially, the quality was not optimal, but my students were grateful for the effort. Following the 2010 podcasting course, much editing and adjustments were made. These were individually packaged on CDs (to cater for access off campus) and were available in the online classroom for easy access. Independent, active, self directed, self-paced learning was fostered and more importantly, the learning event could be repeated, without burdening the lecturer. Students could listen to these anytime, anywhere. In the African context, the mobile technologies seem to have a greater benefit in terms of infrastructure for access. 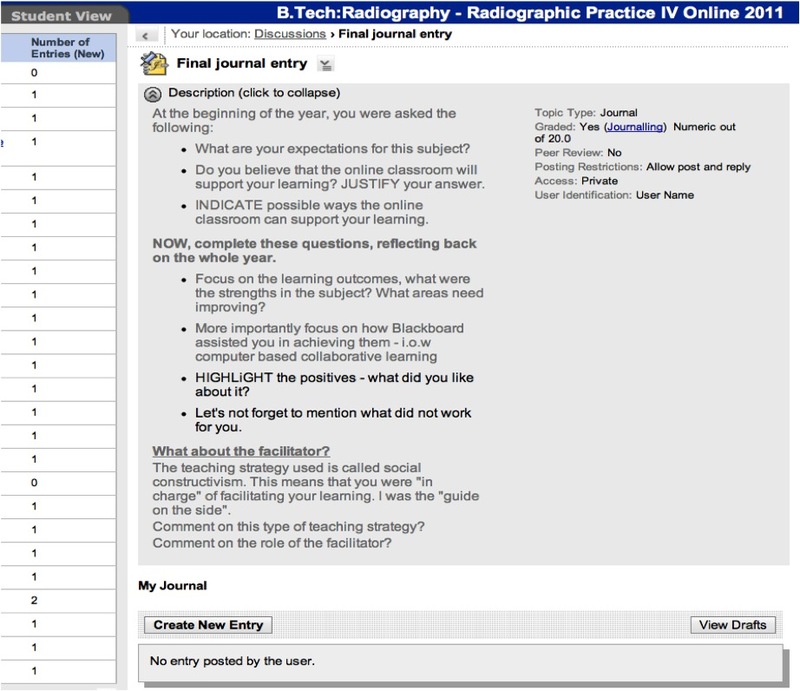 And this was received more positively compared to elearning, by the same group of students (see Student Evaluations). They suggested that this innovation be extended into other areas in the subject. In 2012, more podcasts/audiocasts are being created to assist my students who are “reading challenged.” And the digital natives, who are very comfortable with this medium, will also feel motivated to learn and engage. Other possibilities with mobile technologies will be further explored. Online classroom - (see Blackboard) elearning is a teaching and learning innovation, but the focus must be on the pedagogical use and impact of the technology. Every new development in xray technology significantly improves imaging of the body and clinical diagnosis. Likewise, every technological development in the classroom must have significant impact on learning. The design was critical to the usefulness of the blend in my teaching and student learning. I wanted to improve motivation to learn. Literature argues that 21st century learners prefer structure, which was achieved through the learning modules. This catered for both sequential and global learning styles. Students could now pace themselves and manage their learning. They also demand immediacy, they want immediate feedback. Online assessments provide this (see below for other benefits). 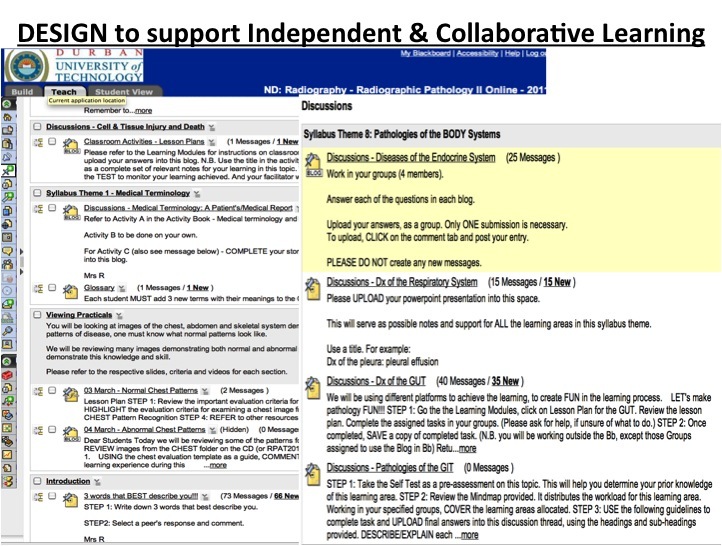 The elearning environment supports independent, self paced and collaborative learning, through the discussion forum. And very importantly, the design catered for language barriers, especially when they had to learn a new language, called pathology. Activities were designed to force them to understand terminologies in the discipline and the glossary tool proved useful in improving their vocabulary. Every week, each student had to add 2 to 3 new terms. Online quizzes (refer to Blackboard classroom) – to help students cope with the volume and the language of a new subject. As with the podcasts, self directed and self paced learning was supported. Students could monitor their own learning by the immediate feedback. 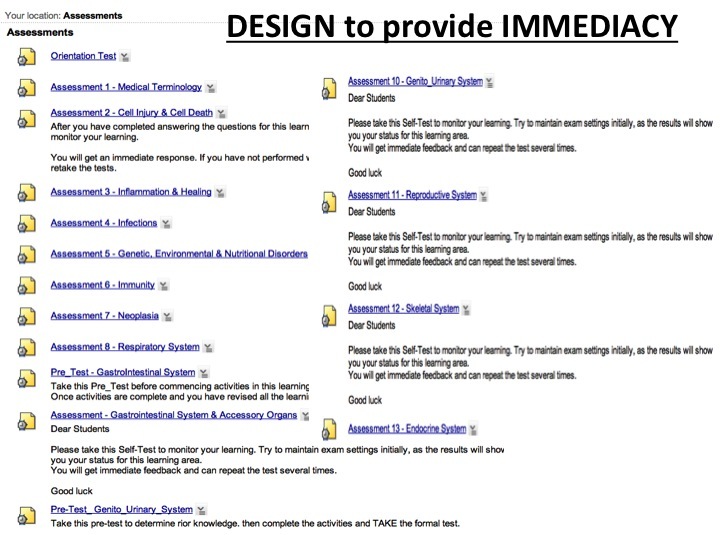 The design allowed for students to repeat the assessments as many times as they needed, without increasing workload. 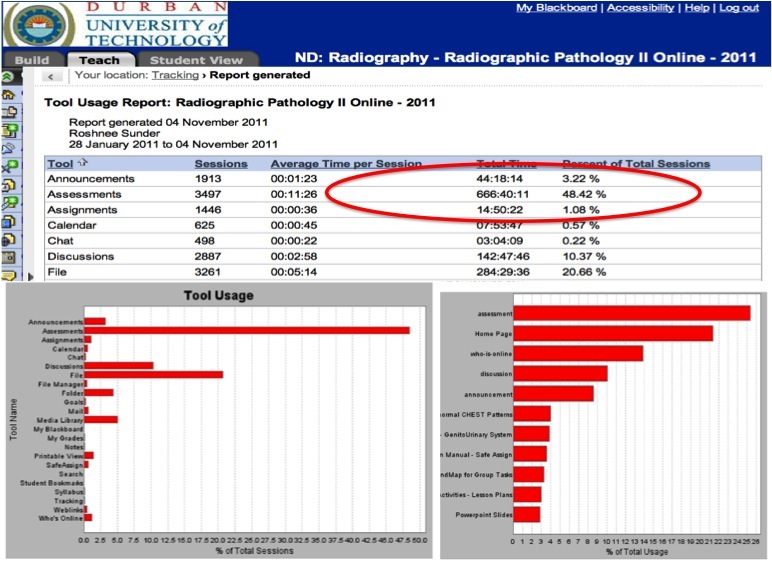 The tool usage report confirms that students spent 48% of their time in the online classroom using the online quizzes. This sample shows a student who uses this tool effectively to achieve the learning. There were a total of 13 assessments in Blackboard. He was able to repeat the assessment (total of 78 assessments) until he was satisfied that the learning was achieved. 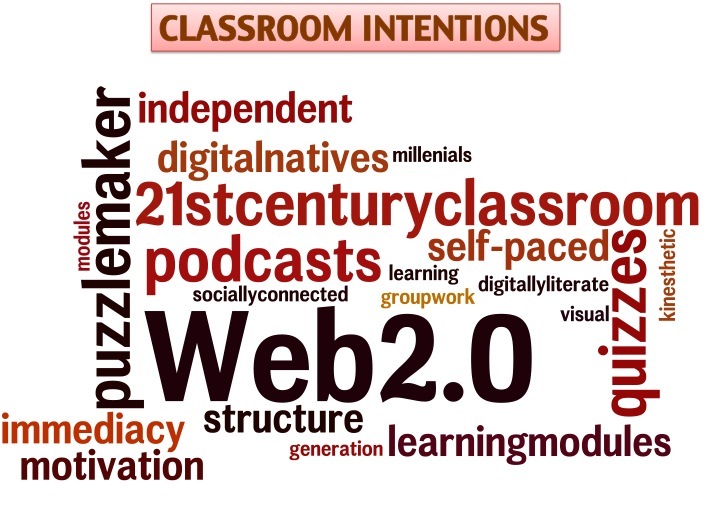 Active learning – was encouraged through web 2.0 applications. Students were encouraged to explore relevant videos on YouTube. Students used Puzzlemaker was overcome challenges with new medical terms. 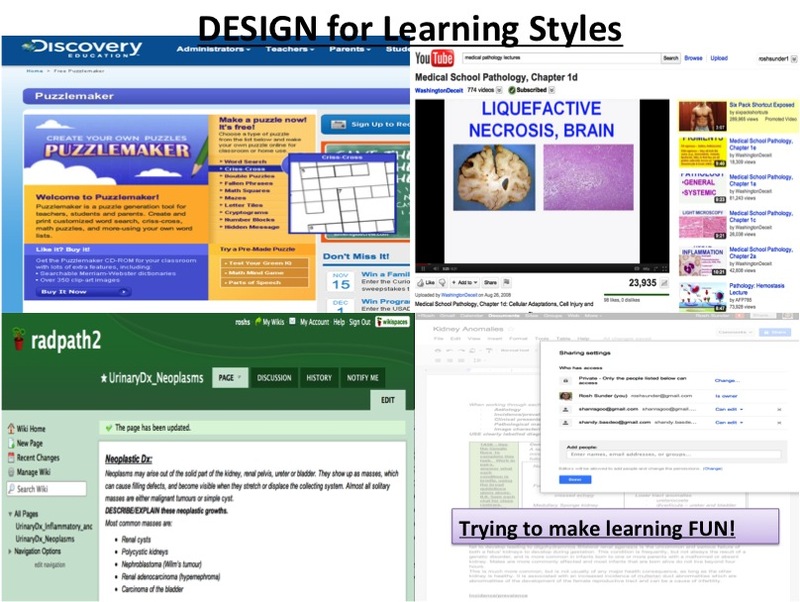 This type of design caters for different learning styles. This was received positively. Other web apps like quizlet will be explored in future. Lesson Plans and Activity sheets – designed to encourage independent learning, while providing structure and boundaries as support. Over time, the design became more student friendly and more visually appealing. See old versus new. 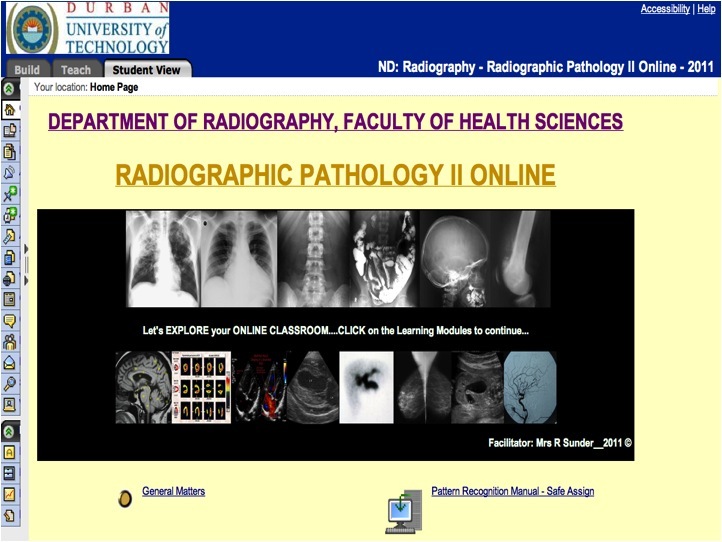 Student generated videos – (click here for Samples) as stated earlier students must demonstrate ability to recognize pathologies on various radiographic images. Previously students were assessed through written assessments which proved extremely challenging for students. 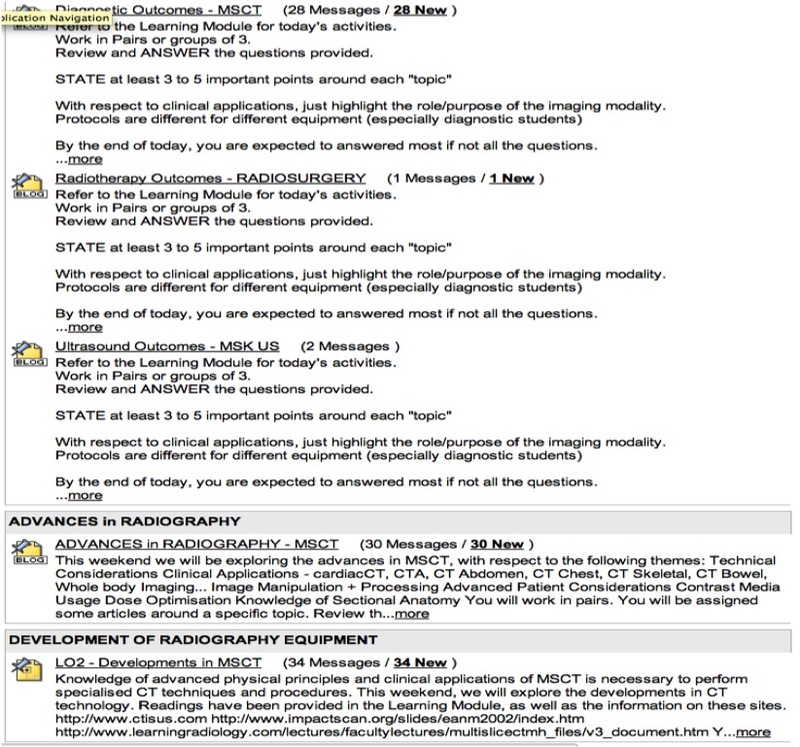 In the real world, students can access external resources to apply this knowledge in a clinical scenario. So, it became more important for them to learn how to access this information and demonstrate the application thereof, rather than simple regurgitation in a written assessment. Written assessments were replaced by case study reporting and further replaced by video presentations. 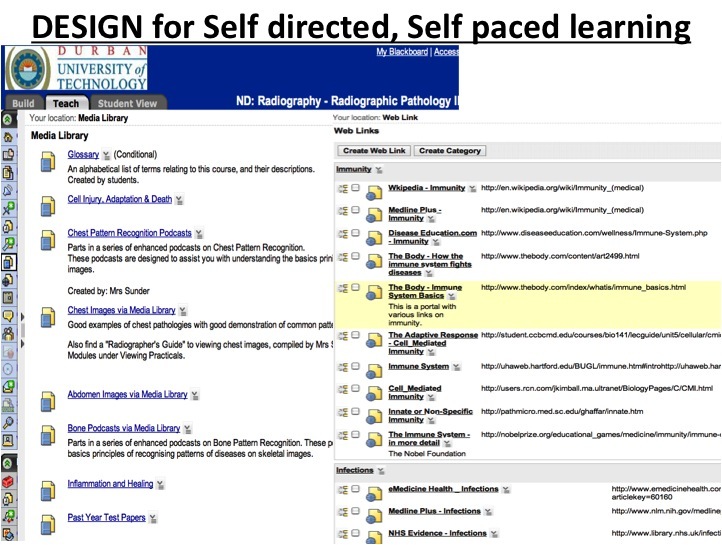 They were also expected to create manuals that radiographers could use as guidelines for pattern recognition. I wanted my student to engage with the learning content at a deeper level instead of passively receiving this information. This is particularly important in a subject that encourages surface learning, by its very nature. I also wanted to infuse some fun into the learning and assessment. The videos show deep learning and learner autonomy was achieved. They were now active participants and producers of knowledge. The evidence shows that they connected with their creative sides and this made the learning experience all the more enjoyable. And they learned much more than just pathology. This was an even greater reward for me than my students, and marking was fun too. Students had been warned about copyright issues, when creating videos. This is an area for development. In 2011, there was a 100% pass rate in the subject. And new ideas for the use of videos in the classroom will be explored. Finally, some of my students will walk away from my classroom with new ICT skills. Also see Self Assessment and Evaluator’s Report for Pioneer’s Course. You may need to download file or open in Adobe Reader, then click on the comment tool to see Course Evaluator’s comments. Web-based learning environments (WBLEs) have the potential to enable and promote constructivist learning and within this paradigm, the roles of the teacher and learner are redefined. The transformation in my teaching and learning started in 2004. I wanted my students to reflect on their learning in my classrooms and outside in the ‘real’ world. I was pushing them into active and independent learning and wanted them to ‘look in the mirror’. It was the first time I introduced blogs in my classroom. They were equipped with a digital diary and a blog site and made regular journal entries….. Going online through Blackboard transformed teaching and learning in this subject. The design in this classroom was also criticial to the outcomes. The tools are appropriate to support constructivist-teaching approaches. It also encourages learner autonomy, which was critical element in this subject. There was total reliance on the internet for learning content and the world wide web was our library. 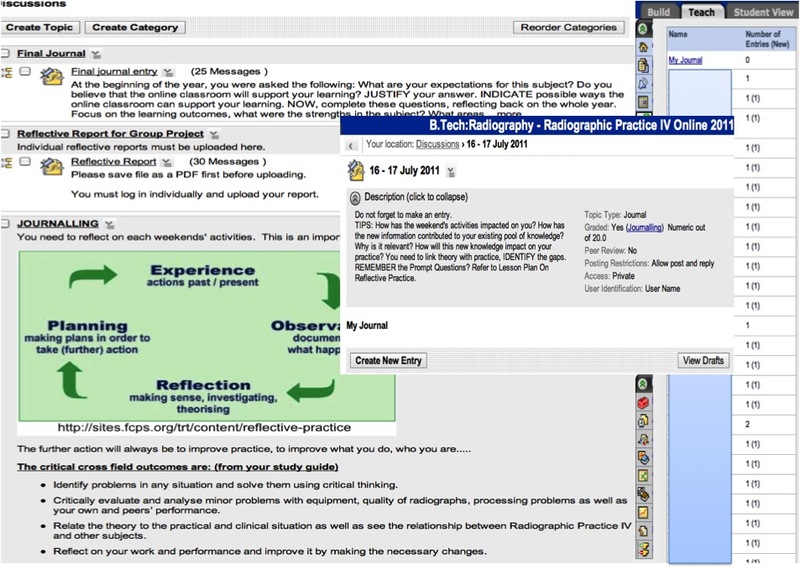 The online classroom encouraged continuity in the learning process and improved communication between lecturer and peers. The announcement tool was very effective for communication and reminders. Learning modules were designed to set boundaries and scaffolding, while at the same time allowing students to construct their knowledge. This was important, especially in a classroom where students could get sidetracked and even lost. This example also shows support provided for the soft skills competencies. Lesson plans encouraged independent learning and provided opportunities for individualism. Students came from very different clinical environments, so learning could be adapted to their needs, while at the same time achieving the overall outcomes for the subjects. 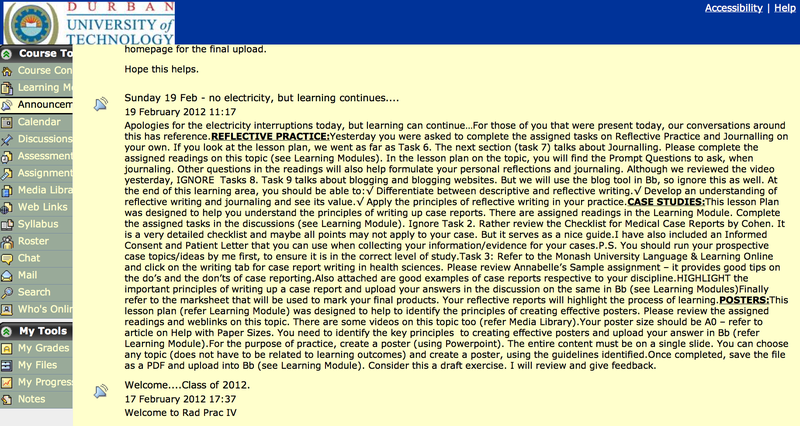 Individual and collaborative activities were structured in Blackboard through assigned readings and weblinks. 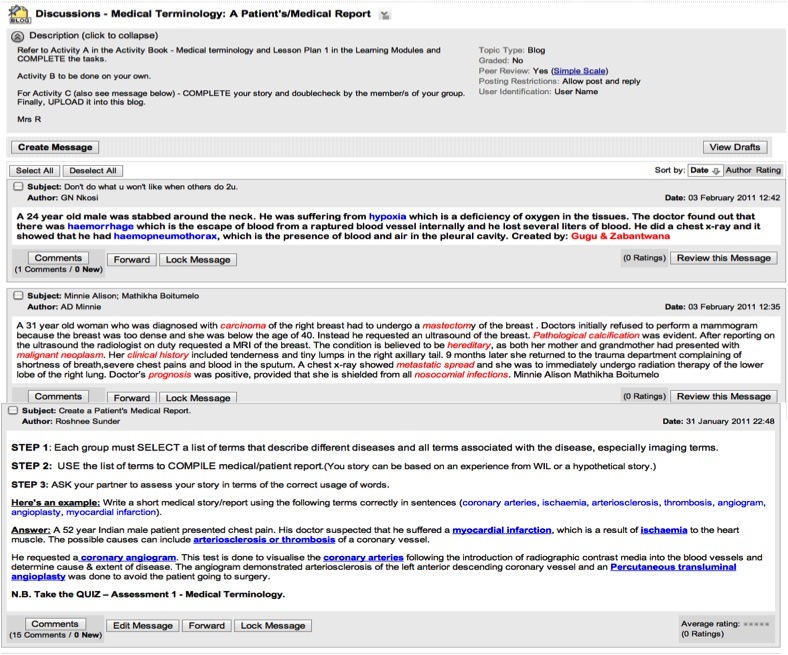 Blogs in the discussion forum, facilitated peer interaction and collaborative learning. Students were active, engaged, independent, in groups and learning was authentic. They constructed knowledge and made connections with their practice. The threaded discussions and blogs allowed for synchronous activities during contact sessions but also supported continuous learning asynchronously. Students were also encouraged to complete reflective journals; a compulsory monthly entry was required. 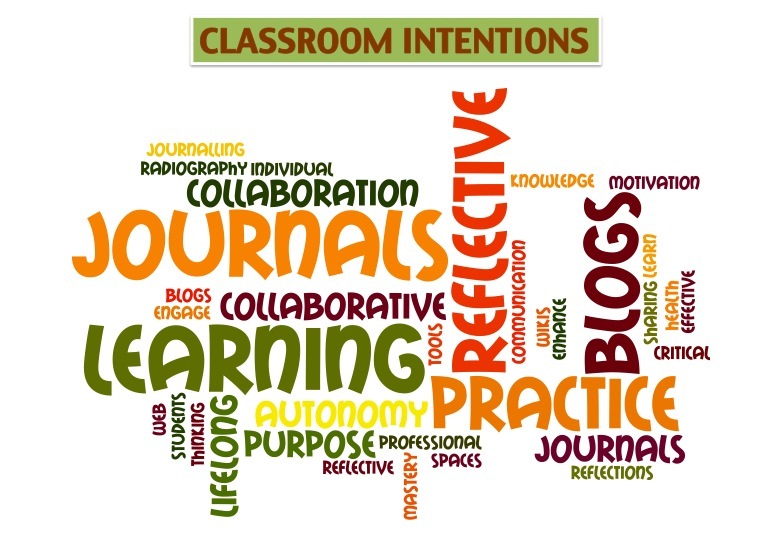 Journals were designed to encourage reflective practice and were part of the summative assessments. Entries were private and only visible to the facilitator and author, to allow a safe space for students to feel free to express themselves, without concern for intimidation or exposure. Lifelong learning was fostered in this teaching strategy, as the working environments evolves, so must our learning. In fact, continuous professional development is a requirement for health professionals. In the final journal entry, they had to include an evaluation of this teaching strategy and how it impacted on their learning. There were other benefits to adopting this elearning style. I call this “paperless” learning, teaching and assessment. Other benefits were courier cost savings and unnecessary transportation of assessments. Positive reports were received from the external moderator for this subject. (see Moderator report). Also see Self Assessment and Evaluator’s Report for Pioneer’s Course. You may need to download tor open in Adobe Reader. 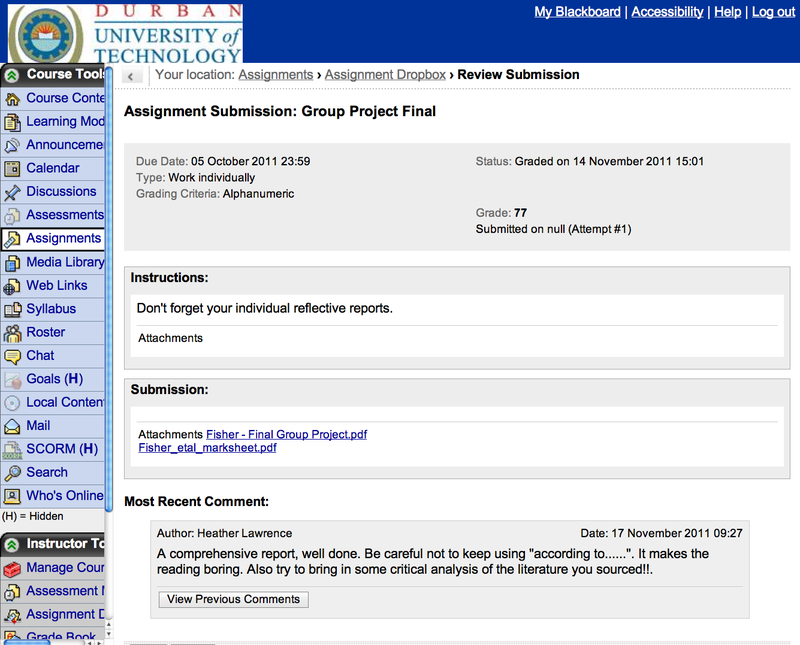 Click on the comment tool in the Adobe Reader, to see Evaluator’s comments.